Introduction: Colonic volvulus is a rare cause of intestinal obstruction typically described in the elderly. The purpose of this study was to evaluate a single institution twenty-year experience with volvulus and to compare differences between age groups. Methods: This study describes a retrospective review of all adult patients who were evaluated for colonic volvulus between 1988 and 2008. Data are expressed as mean (SD). Chi squared was used for proportions, p<0.05 significant. Results: 76 patients were evaluated, 53% were male. Mean age was 71 (17), ASA was 2.7 (1), and Charlson Comorbidity Index was 2 (2). 71% of patients presented with sigmoid volvulus while 24% had cecal volvulus and 4% had transverse colon volvulus. Overall mortality was 22% and there was a 54% complication rate. Mortality was 16% for cecal volvulus (n=3), 19% for sigmoid volvulus (n=13) and 33% for transverse colon volvulus (n=1). Average hospital stay was 17 (8) days. 58 patients (76%) were treated surgically, 12 (16%) by colonoscopic or radiologic decompression only, and 6 patients (8%) had no treatment or simple placement of a rectal tube. Interestingly, 34% of patients (n=26) were 65 and younger, and 3 patients were in their twenties. Patients >65 had a higher complication (64% vs 38%, p=0.05) and mortality (30% vs 8%, p=0.04) rate but also had a higher comorbidity index (2.6 vs 0.6, p<0.01). 68% of patients > 65 underwent surgery while 88% of patients 65 and younger underwent surgery. There was not a significantly higher proportion of patients with cecal volvulus in patients 65 and younger (31% vs 20% p=0.4). Mean age for cecal volvulus was 68 and for sigmoid volvulus was 73. 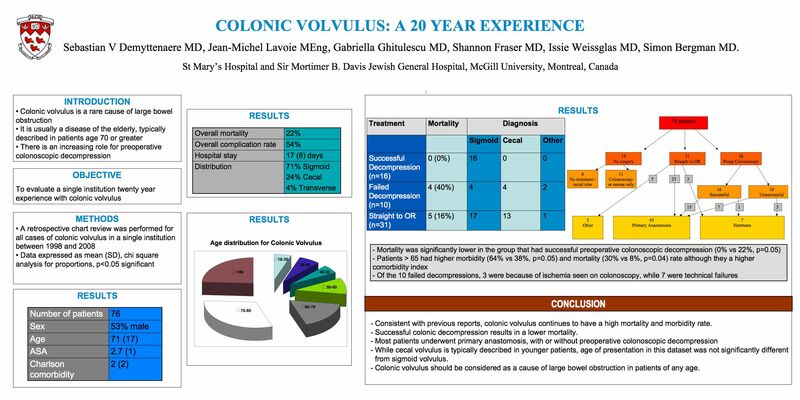 Conclusion: Colonic volvulus should be considered as a cause of large bowel obstruction in patients of any age. While cecal volvulus is typically described in younger patients, age of presentation in this dataset was not significantly different from sigmoid volvulus.